One exciting wet Wednesday in Kidsgrove and a small bomb in Wombourne #narrowboat #England – The Diesel-Electric Elephant Company. …and if that blog post title doesn’t compare unfavourably with ‘It was a dark and stormy night…’ then I’ll go to the foot of our stairs, eat my hat and crush a grape. We haven’t really begun the winter season yet in England, but it has already been dull, overcast, oppressive, windy, rainy and cold for months. Full and proper daylight would scare the hell out of me now. The Cardinal and I are moored on the opening yards of the Macclesfield canal, just above the aqueduct where it crosses the Trent & Mersey canal (that has, by this stage, dropped down by two locks). Tis not my intention to venture far up the Maccy at this time, since it lacks any and all things in the way of services, and this is not the season in which to either be jolly or find myself iced in somewhere far from water/rubbish/&etcs. When we move we shall do so backwards, reversing over the aqueduct, turning in the little boatyard curve beyond and oiking ourselves back around and onto the T&M as remains the plan. Not today though, since it is breezy, and there is water falling from the sky. The T&M route ahead presents a format of locks that is new to me, the “twinny”. These twinnies are locks, side by side by side. This one is broken (notice the red “Closed” sign, and the paddles swathed in plastic “Awoogah” tape). When twin locks again become single. Broken. Twin locks. One wonders why. This is the junction of the Macclesfield with the Trent & Mersey. The Cardinal and I will be mooching out of the archway shown here top-centre, hanging an immediate ninety-degree turn to the right, and choosing ourselves one chamber of this, the first of the “next” locks. 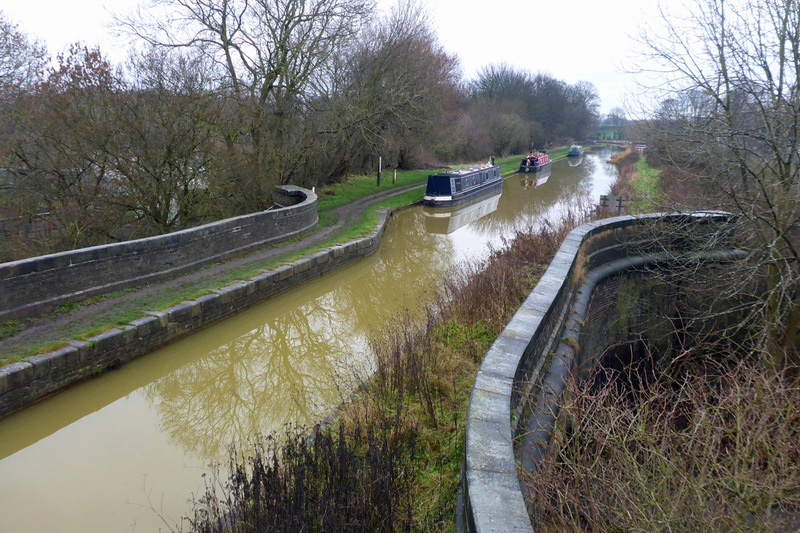 Junction betwixt Trent & Mersey canal and Macclesfield canal. It’s like boating on Mulligatawny soup. A bomb in Wombourne, eh? I love the name Wombourne, it sounds as though it ought to be the place where wombles are born, where Madama Chaulet goes to climb into the stirrups and squeeze another one out nine months after each drunken party on Wimbledon Common and being no better than she ought. Police report here. H.M. Constabulary seem to be confused though over whether tis a WWII mortar or something hung-over from the nineteen-sixties. Were mortars really being flung about with flower-power abandon in the nineteen-sixties? I might ask older, wiser and more experienced members of my family, but they were all too wasted on recreational drugs then to be regarded as reliable witnesses. Not much different these days, really. Either way, the Police plan on letting it off, probably as part of the fireworks at the Wombourne Policemen’s Ball on Saturday. In England they’ll probably put it in a bucket of sand and prod it with sticks or throw stones at it until it goes off. In the U.S.of.A. doubtless the tactic would be to count down from three, throw it in the air and invite all present to fire at it before it falls back down to earth. The Birmingham Mail (“news” “paper”) seems to think that it dates from World War One (title) and from both World War Two and the “The Nineteen-Sixties” (body of article). Given the political news of late, I know where I’d like to shove it, although I doubt that it would yield sufficient wallop to do all of Parliament the Guy Fawkesean good that I intend. Wombourne is south of here, and not somewhere that I have been or intend upon visiting soon, certainly not until they’ve cleared the place of rusty ordnance. While it may not be big enough to stop England looking like a chimpanzee playing the lead in a Christmas pantomime, something like that would indeed put a serious dent in any unsuspecting narrowboating chap’s day, should he moor over it at an inappropriate moment in re sudden spontaneous exothermic reactions. Oh, hang on – I am an unsuspecting narrowboating chap. The perils of boating in England, eh? Did we “win” WWII? I very much doubt it, but I’ll give you my final opinion once it’s all really, honestly over. The regularity with which we keep finding these things, both Allied and Axis, is quite depressing. Pootle pootle pootle BOOM! Putt putt putt putt lovely day, isn’t it, Vicar? – BANG! What a very silly species we are. So, post-Harecastle Tunnel, between oppressive grey cloud, rain and excessive breezes – and the occasional rusty UXB – that’s about as exciting as it gets around here, for the moment. I’m going to liven things up with a(nother) curry for lunch, later. I shall rustle up something with more of an (agreeable) bang than some old mortar bomb. The highlight hereabouts so far has been the discovery of Kidsgrove Library’s books for sale shelves in the library foyer. Tis sad and annoying to see public books being flogged off at 50p a pop (especially when these “library bindings” will have cost H.M. Taxpayer twenty or thirty quid each…) but I consoled myself by finding five decent and semi-decent ones to take into protective custody. The odd one out, in the middle, I splashed out 50p for in order to research into what exactly someone who is but 13½ years old can whip up into an “autobiography”! The others look genuinely interesting. Oh – and there’s a spot of a tree down in the canal up ahead on the T&M. It’s only blocking half of the canal though, so tis possible to squeeze past it. Many more days in Kidsgrove in January and I shall have an unhealthy portion of respect for and sympathy with elderly trees who throw themselves into the canal. They do say that a tree’s bark is worse than its bite. I can’t take this endless photosynthesis anymore, wheeeee – splosh. R.I.P., Silver Birch (I think). That’s all folks, that’s the news. Ian H., and Cardinal W.
I have lived in towns where I wouldn’t have been the least bit surprised to discover that the corporation park shrubbery was throwing itself into the boating lakes to end it all – Grimsby, for one! Is to let off something one really mortar? It could be mortarfying. That twin locks looks interesting. I have a quirky fancy involving when the river stops flowing in a drought, that one could use the two locks in tandem — one boat up, one boat down. Those would be Japanese. The Germans are more pragmatic! I see you have correctly disparaged my fellow countrymen’s reaction to something as dangerous as an unexploded bomb. I only wish I could take offense, but Florida Man, will be Florida Man. In Poland they put the bombs in the trunks of perfectly good cars and wait for them to explode. Ultimately, the UXB does seem to attract all the Darwin Award Contenders. And depending on your position on idiots deselecting themselves from the gene pool – it might be considered a bright side. At least one country in North America too. That didn’t improve the polish on that car one bit. The purpose of the exercise escapes me, unless he seriously disliked that car. You underrate mousekind. I bet there was one that took cover in front of the engine. The answer you’re looking for is, ‘because’. I’m not looking for that reply but I suppose it is the only one I’m likely to get! About as intelligent as stuffing a huge purchase of fireworks into a (stolen) car’s trunk and setting them off in a parking lot with a crowd around – and filming it to post on FaceBook. I hope these suicidal trees aren’t dislodging any rusty ironmongery that got buried years ago! It do look a bit bleak all of a sudden after the very pretty autumnal hues. Not withstanding the difficulty in negotiating locks for a single crew at least with a twin lock when one gets broke it doesn’t stop the passage or put pressure on the powers that be re maintenance other than the application of notices and taping up of moving parts that is. The thought of what you have to do to get past a lock makes me want to go and have a lie down! Happy Curry Day! Curry Day is always a happy day. As is the day before, and the day afterwards, sometimes two days afterwards. 🙂 I do wonder if they built the twinny locks just because they could?